What do I teach my children? How do I feed my family? Why do I live in an abusive environment? What can I do to make the lives of my children better? Native American women on most reservations ask these questions daily. A Native American woman spanning two cultures is comparable to a tightrope walker balancing forty feet over a bottomless pit of seething, boiling lava. She bridges the gap between two diverse cultures, one traditional the other white. Pressured to instill Judeo-Christian ethics in her young and pressured to keep cultural traditions alive. In the pre-reservation era, men and women had definite roles that kept family units and tribal units functioning. Today one tribe dealing with this conundrum is the Confederated Salish and Kootanai Tribes of the Flathead Nation.Salish are a plains-plateau tribe; they're considered hunter-gatherers but also had a permanent camp they used year round. They are a gentle non-warring community who fought if threatened, but also quickly accepted strangers for the outside experiences. The Salish are a matriarchal society, many of their traditions closely following the Iroquois with whom they freely traded. They raised crops, cultivated fruit trees and grew bitterroot, the staple ingredient of their foodstuff. Their culture was rich with a unique language, customs and traditions. Men hunted and women did the rest; men governed, women appointed members of the tribal council. Woman gathered tubers, berries, and cultivated tobacco, corn, and sweet potatoes. They scraped and tanned hides for clothing and shelter, their vibrant beadwork also told stories of hunts or the beauty of nature which decorated their regalia and tepees. To sustain the tribe, they dried and smoked meat and fish caught by hunters. Women and children gathered wood for cooking fires and warmth. They utilized animal bladders to carry water for cooking and drinking, and tended to the needs of their children and elders assuring the tribe joys of their young and the wisdom of the elders. When moving camps was needed, women tore down the heavy animal skin coverings of their lodges and used some of the poles to make a travois to carry their few belongings. But being a Native American woman was not an easy life; there were many restrictions during menstruation and pregnancy. During menstruation, she was kept apart from men lest she sap strength needed for the hunt. A young woman reaching the age of menstruation went through a rite of passage. During her first menses, she was given to an elder woman of the tribe, usually a grandmother or other close relative. She was forbidden to speak to anyone during this time. She rose before dawn to bathe in a possibly frozen river or lake. She prepared food for her family, but could not eat until all had eaten, because she only accepted food given by an elder. She did the bidding of any elder with no question. Next she was sent to the mountains to fast and find her Spirit Guide. Her Spirit Guide would then give her true name, a name not known to anyone but her. Once she passed these tests, she was required to sleep behind her parents far from the door to the teepee so no man could know her before marriage. Virginity was desired but as with all young, sometimes ignored. Marriage was simple; a man would bring buffalo robes and horses as gifts for her parents. If this were acceptable to everyone, he would build a teepee close to her family clan, and they would move in together. If the warrior wasn't a good provider or was abusive, she would simply place his possessions outside the teepee and then he left. She simply moved back with her parents until someone else wanted her, a much simpler solution than hiring a lawyer and spending money that most do not have. During pregnancy, she wasn't allowed to gaze upon a horse because she might steal its spirit. When moving camp during hunts, she walked because of the Spirit of the horse. In the Salish tradition, to keep her child from wandering, she was forbidden to gaze out the tent flap at the sky. Before giving birth, her husband built a teepee away from camp; her mother, grandmother and aunts tended her. They scooped out a depression in the earth and lined it with fragrant moss and soft grass. She squatted holding the ridgepole or her mothers' hand while giving birth, then stayed in her own teepee apart from everyone until she healed. Food was brought to her so she could bond with her child. She used a cradleboard decorated with beadwork lovingly done by elders and lined with moss and lichen. The tribe encouraged babies to look around to observe tribal life; they were bundled securely for safety and to teach them stillness. Children were pampered, allowed to do as they wished, the tribe helping to raise each child. Through observation, they learned to work for the good of the whole tribe. In play, they learned skills of adults and individual roles each played in society. No individual was better than the rest; men and women were equal in stature. Until White man entered their lands and intruded upon their lives, this simple life sustained the Salish for many generations. The Indian's sent for Jesuit priests after hearing Bible stories told by Iroquois Warriors. Several parties sent to St. Louis to bring back a priest never made it, only one party getting through. In 1837 Father Peter DeSmet came to the camping place and during a period of 15 days converted 1800 Indians to the Roman Catholic religion. Several missions were built on Indian lands; one beautiful example is the St. Ignatius Mission in St. Ignatius, Montana. Indian children were sent to boarding schools to learn to clean houses and glean fields. Warriors were put to work building churches and running the gristmill, women worked for army officer's wives as washerwomen. The lives of these people were forever changed by the loss of lands to gold seekers who followed the priests. Stevensville, Montana was the first white settlement built on the bones of dead Salish and sustained by Salish gardens and orchards. When the Indians were forced onto reservation lands, all weapons possessed by Warriors were confiscated. No longer able to hunt for game, most of the Warriors lost their identity. They no longer had a contribution to offer; they could no longer feed their families, and they were forced to become farmers, a totally alien occupation, and contrary to their traditions and beliefs. Whole families died of starvation because they were given rotten meat and unfamiliar flour to eat. In Judeo-Christian cultures, a hunter-gathering society was a society of savages. The delicate balance that had for ages delineated men and women was torn apart and trod upon. Men no longer had a purpose, farming was alien to them and was considered the work of women and old men with too aged to hunt. When the tribe was introduced to liquor, drink became for many the drug of choice. Liquor dulled pain and memories of a life lost forever. The Salish, once a proud nation, were considered less than human; they were treated like dogs in the gutter; women were considered shiftless and lazy, children were considered "nits of lice," unteachable, and throwaways. Strong warriors, reduced to comic relief, were mocked by Whites and pointed at as being lazy, dirty and unable to hold their liquor. Many were kicked, beaten, and sometimes murdered if found in gutters, Devious Whites through gambling and drink stole Salish lands. Non-Indians own 76% of reservation lands, but grumbling continues today to disband reservation land to give control to the state and White ranchers. With no land or means to sustain themselves, many men started to abuse their wives and children, a practice that still occurs frequently. For a man on the reservation employment is at best sketchy. There are few job opportunities and the white population doesn't employ Indian men or women except in menial jobs. The majority of the white community looks upon the Salish people with distrust. Studies show that 50% of the husbands and fathers are abusing their wives and/or their children on the reservations. Successful tribal men work in mills or for the tribe and fight for an education for themselves and their children. They teach their children how to hunt and fish, and they instill a reverence for nature and the land. They take time to teach their children pride, pride in their accomplishments and pride in their traditions. They look to the past so they may see the future and teach their children the same. They know change is slow but they also realize that all change isn't necessarily good. They keep abreast of national events because what effects us nationally will eventually effect us locally. They fight public opinion that reservations are "bad places," and look upon them as their birthright. Levi's, plaid shirts and cowboy boots are the normal wear but most men also have buckskin, beautifully beaded moccasins and feathers for ceremonies. They try and teach their children that money isn't everything, family is most important and pride in their culture is what is important. Women are not blameless, 40% of women abuse their children because they foresee no future and this is the only life they've known. Today, Salish women no longer tan hides; she sews, knits and crochets to keep her family in clothing. She shops at Safeway or Wal-Mart, she either does her laundry in a Laundromat or at home in her washer and dryer. Taboos are different; she doesn't go to the mountain to receive her sacred name, she is named on paper when she is born. Most reservation women and men hold low paying jobs, if they are lucky they cut wood or become maids at a local motel. The white community tries to prove that reservations don't work and use the excuse that most tribal people are on Welfare. Education for Indian youth is a problem for the community as a whole. Reservation schools have all white teachers who teach the majority of all white classrooms. The dropout rate for Indian children on reservations hovers near 80%. The Tribe is trying to get Native Language and traditions taught in the public schools. They hold classes constantly to keep alive the rich traditions and proud cultures they almost lost through years of oppression. The tribal council is working hard to change the image of what people perceive the typical Indian to be. They realize the key to the future is their youth. The reservation has its own Community College, the Salish and Kootanai College. A young person can major in business Administration, a RN Nursing Program, Accounting, Forestry, Native American Heritage and other courses. There are only a few computer classes because computers haven't infiltrated their society as much as they do here. Young women are encouraged to enter nursing professions or become Social Workers because traditionally women in the tribe were the healers, the Shaman. Successful tribal women have learned to combine the two cultures; they are the ones learning to teeter on the tightrope between the two cultures. They emphasis the great need for education yet, they also instill a love for the old ways. Their children belong to either boy scouts or girl scouts or drum groups and dance groups. They have learned to compose rich essays and relate tribal folklore. They live in modern homes but may keep a teepee erected in the backyard to remind them of the past. They furnish their homes with sofas and chairs but on their walls are reminders of hunts, dream catchers, and on their tables sit pottery they themselves possibly made. They may wear Calvin Klein but almost every woman has dance shawls or buckskin regalia. They drive cars but also take pleasure in riding horses into the mountains to feel the wind against their skin. Technology is far behind what we would consider normal, yet they are trying to enter the technical age by having an electronic systems business owned by the tribe that makes computer components for NASA and the military. Tribesmen make these components without knowing the function of the product. This business only employs sixty or seventy people from a population of 6000. Most of the white-collar workers come from off the reservation because there is little supervisory training available and the business classes only graduate one or two each year. Most educated Indians work in large cities rather than taking their expertise back to the reservation. They make far more money away from the reservation then they can on it. Most of the young enjoy the bustle of the city with its many advantages then on the reservation where a feeling of helplessness prevails. The Salish Tribe is considered a role model for Tribal Governments; they have a yearly budget of over $50,000,000. Most of the money is used to buy back tribal lands and care for families. The tribal council doesn't want a totally Indian owned society, it wants lands for their people. Caring for the elders is a part of our culture and to do an adequate job land for housing is essential, nursing homes for elders show respect for culture and traditions. For the first time in Salish history, two women sit on the Tribal Council elected by those living on the reservation, one an elder who lived through the boarding school experience, the other, a young single mother trying to raise her children to be honest, hard-working members of tribal society. The Tribe is the largest employer on the reservation and people hired are those who completed high school. They don't want to attract big business because of pollution to the reservation, but they are aware without big business, their economy becomes stagnant. The Tribe owns and manages the largest buffalo herd and wildlife preserve in the United States outside Yellowstone National Park. 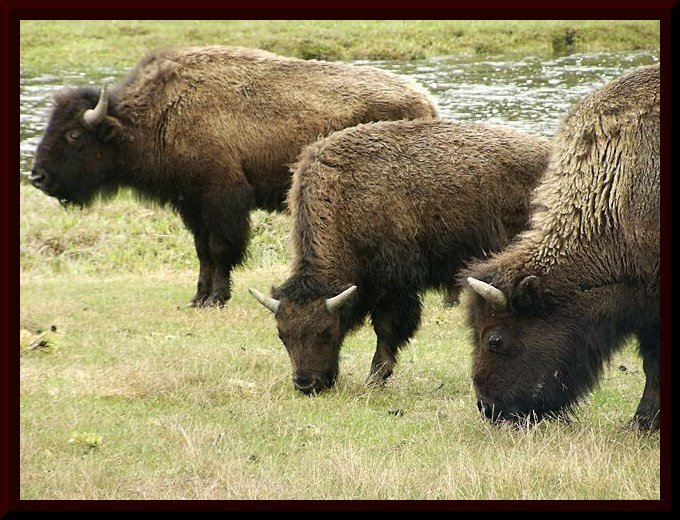 The people take pride in their herds of buffalo, antelope, elk, moose and eagles nesting in trees older than this country. Young natives manage the park with elders overseeing the work. Just as in the past, young learning from their elders. It is not the perfect society and may never again be a perfect society, but it is one that for many, works, and change is slow coming. The questions asked in the beginning might never find answers but my people are trying to adapt to a world they never wanted. The brightest young men are being sent to Universities to get degrees in Law to help fight for tribal rights through the Federal Court system. The hunts of the past are finished, never to rise again except when they cull the buffalo herds to feed the elders through the winter. For two cultures to coexist together, both the Native Americans and the white society must work for a common goal. Both sides have to see the positive in each culture and take from it what is important. The Native Americans have to relinquish their memories of the wrongs done to them as a people and the whites have to realize that as a culture, the Indians flourished and thrived long before they set foot upon this land. The whites have to learn to respect our culture and not dismiss the traditions as savage and primitive. They must both learn to work together for the common good, not just what one segment sees as good. Alcoholism and drug addiction are rampant problems on the reservation as in most societies, with abuse their second cousin but traditions sustained for centuries are returning, and pride is swelling like tides against rocks. Someday the Warriors cries may again be heard with pride, but for now I can say with my head held high, I am Salish and I am proud.